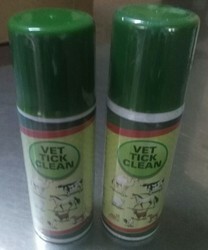 Our range of products include vet - fungi care spray, vet - tick clean, vet - healer spray, oxytetracycline spray and fipronil spray. Mange, Scabies ,Eczema & Prurities. Clean the affected area . Storage: Keep away from heat . Do not refrigerate. Dermatomycosis, Maggot infested wounds and broken horns. For tropical application only . Shake well before each use. Keep away from eyes. 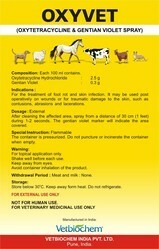 Avoid container inhalation of the product. Meat and milk : None. Storage: Store below 25 0c .Keep away from heat. Do not refrigerate. 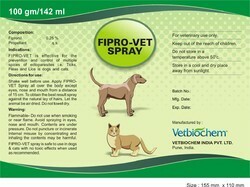 Fiprovet is effective for the prevention and control of multiple species of ectoparasites i.e. Ticks , Fleas and Lice. 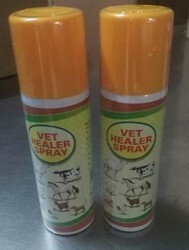 Apply spray all over the body except eyes , nose and mouth from a distance of 15 cm . Do not use when smoking or near flame . Avoid spraying in eyes , nose and mouth . Do not puncture or incinerate internal misuse by concentrating and inhaling the contents may be harmful . it is safe to use with not toxic effects when used or recommended . 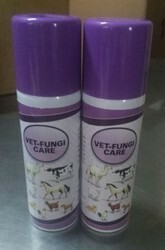 Looking for Veterinary & Herbal Spray ?